KidsHealth has teamed up with the Michael Phelps Foundation to create imHealthy and imSuccessful learning programs that empower kids to live healthy, active lives. 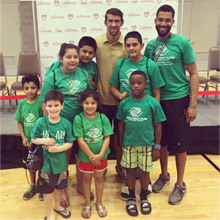 These programs are part of the Michael Phelps Foundation's imProgram, which teaches kids the basics of living well, including being physically active, water safety, eating right, and managing stress. Kids learn through fun interactive lessons. Below we feature our new behavioral health series inspired by Michael Phelps, a 23-time Olympic gold medalist, and his challenge to overcome anxiety and depression. The lesson plans help kids handle strong emotions and worries by learning to manage them in healthy ways. To view these lesson plan PDFs you'll need the free Adobe Reader. Handout 1: How Can Self-Talk Help?